Paulo Kavunido and his wife Feibe raise coffee, tomatoes, maize and eggplant on their farm 18 miles north of Jinja near the banks of the Nile. When I stopped to visit with them about 90 Kg of recently picked coffee beans were spread out on the ground in front of their house to dry in the sun. Paulo told me they get about 2,000 shillings per kg, or about 70 cents a pound for their beans. In a good year they’ll pick about 1,000 Kg of coffee beans and earn 200,000 shillings. They earn another 300,000 shillings a year (in a good year Paulo hastened to add) from the vegetables they sell. Tomatoes are a good crop because you get 3 harvests a year from tomatoes… only two crops a year from coffee. The crops are grown on a one acre plot that Paulo inherited from his father. His brothers took off for the city when they were old enough so Paulo decided to make use of the family land. Paulo and Feibe have three children under 4 years old: Edward Kibukka, Mwanje Rollens and Paulo Mutcghumla. They live in a small one-room house built of mud and wattle. But stacked up in the front yard are piles of homemade bricks for building a new house. Paulo made the bricks himself over the past few months, shaping them from mud from his front yard and drying them in the sun. This brick making method is used all over Uganda. After the bricks are dried, they are stacked and covered with straw or banana leaves and a fire is started in a built-in hollow in the brick stack. After a few days the bricks are fired and ready to use. Bricks made in this way last 100 years or more. Paulo said he’s going to start construction of a new house in January. Paulo and his family raise much of their own food on their little farm. But still have to buy staples like sugar, salt, matoke (roasting bananas…a staple of the Ugandan diet) rice and other things they don’t grow themselves. Their total cash income from the farm is a little more than 40,000 shillings a month, or about $30 US. Everybody in the family seems healthy and well fed. Some financial problems loom a couple years ahead when the children start school. Fees at rural schools can be 10-20,000 shillings a month…an amount that could bust the family’s slender budget. I ‘m hoping to visit them again before I leave Uganda in April. 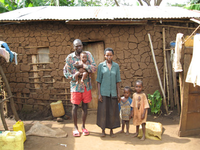 This Ugandan farm family reminds of nothing so much as the pioneers and homesteaders in the U.S. in the 19th century. Like Ugandan farmers, the homesteaders grew their own food, and figured out the most salable crops to raise for the market; they had little control over the prices they sold their crops for…sometimes selling to wholesalers and middle-men…sometimes selling directly to the public in local market towns. Like Paulo, the homesteaders built their own houses with local materials, worried about how to get their crops to market and wanted their children to get educated and have a better life than their parents.